Since its inception, FPR has proposed a Visitor Economy strategy for Puerto Rico. After hurricanes Irma and Maria, this approach became more relevant than ever as many on the Island continue to migrate to the U.S. mainland resulting in a smaller tax base and diminishing demand for products and services. This has particularly affected many small towns in Puerto Rico, where local business owners rely heavily on community residents to sell their products and services. As a result, these communities need a different, innovative and inclusive plan to bring in visitors to create new economic opportunities. 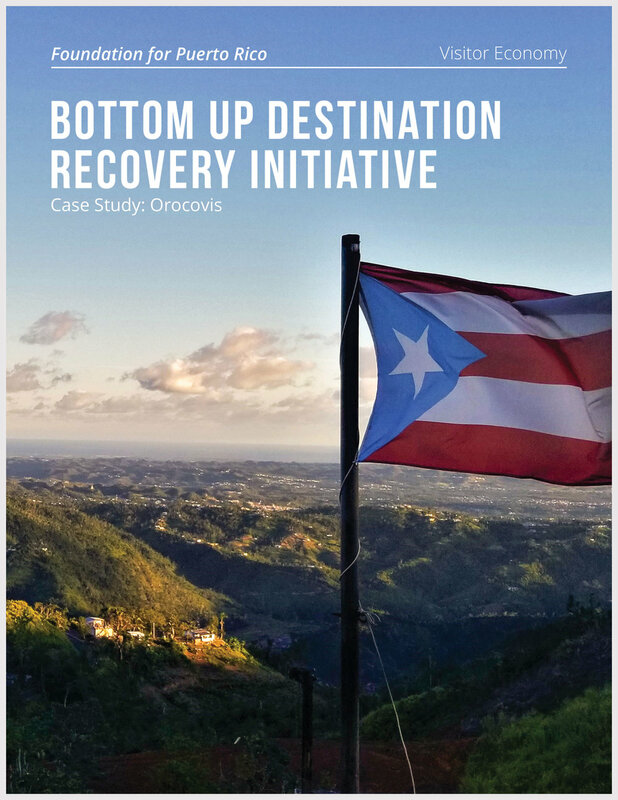 Precisely, the Bottom Up Destination Recovery Initiatives a short-term economic recovery strategy with a sustainable model, supporting communities to become more resilient and active resources in the creation of tourism attractions and experiences.This community-based recovery program aims to strengthen local communities to spur their recovery and build the infrastructure required for growth. The goal is to help communities recover quicker by creating a Community Destination Economic Development Plan to help increase the local tourism offers and foster the extension of the average length of stay. Proposes a new community economic development model based on five main principles: visitor economy oriented; asset-based approach; community-based approach; resiliency; and action-based. Focuses on four impact areas: basic needs and infrastructure; business support; branding and marketing; and social capital. These principles and impact areas converge in a holistic approach to support and strengthen more resilient communities across Puerto Rico. Emphasizes on short-term recovery strategy and long-term planning and development. Presents policy recommendations on community resilience approach; sustainable economic community development; and community destination planning.